The completion of the Erie Canal in 1825 elevated New York City to a major port, but before then, Boston and Philadelphia were the primary seaports of the fledgling United States. Boston, of course, was marked by America’s first lighthouse, and one of the twelve colonial lighthouses was placed at Cape Henlopen to mark the southern entrance to Delaware Bay and River that lead to Philadelphia. Located just over ten miles into the bay and adjacent to the main shipping channel, Brandywine Shoal was a threat for vessels bound for the City of Brotherly Love. Lightship “N” was anchored near the shoal in 1823. One of the country’s first such vessels, “N” was built in New York, measured seventy-two feet in length, weighed 120 gross tons, and displayed a fixed light from each of her masts. Naval Lt. William Porter inspected the ship in 1838 and issued the following report. “Fifteen years old; very much out of order, requires thorough repairs. The cause of rot in our light-vessels can be attributed to the following causes: want of care and proper ventilation and the mephitic vapor rising from bilgewater. All causes can be obviated by the use of the common windsail (or tin or copper ventilator), and the inverted bellows, as used on board of the vessels in the Navy, which has proved of decided benefit in expelling the noxious vapors arising in a ship’s hold.” The ship certainly didn’t provide a healthy environment for its inhabitants, but surprisingly the vessel would not be retired until 1859. The first attempt to replace the lightship with a permanent structure was launched in 1827 when William Strickland of Philadelphia erected a wooden pile structure on the shoal. A sum of $29,200 was spent on the project that year, but the structure sustained serious damage from the sea before its completion. An additional $10,000 was allocated the following year to preserve the structure, but this only delayed the demise of the lighthouse by a few more months. Major Hartman Bache inspected the site in 1835 to determine what type of structure was best suited for the shoal that was buffeted by the sea and, during the spring thaw, swept by ice flows. Bache’s proposal called for a stone foundation topped by an elliptical, squat lighthouse. 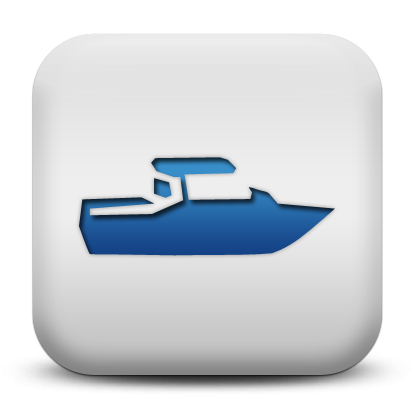 The artificial island foundation alone would cost $84,500, and the entire project an astounding $124,000. 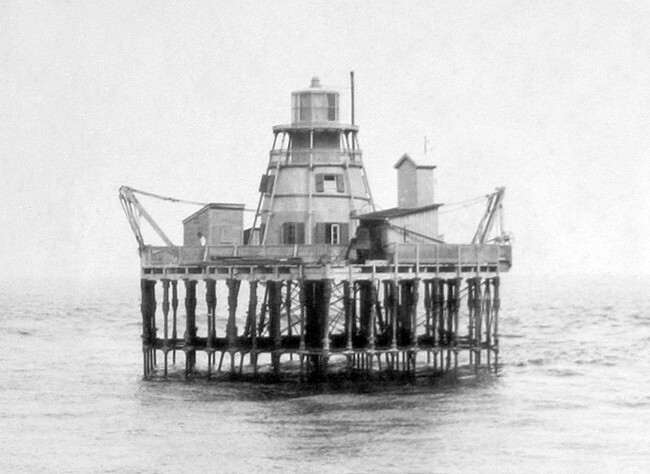 Intrigued by the novel design, Albert suggested that a screwpile lighthouse be tested on Brandywine Shoal, noting that if successful it would be markedly less expensive than Bache’s earlier proposal. Congress approved $30,000 on March 3, 1847 for the screwpile experiment, and construction commenced in May 1848 under the direction of Bache and George Meade, who would later supervise the placement of screwpile lighthouses on the Florida Keys. Congress provided additional funds for the lighthouse in 1849 and 1850, bringing the total cost to $62,000. 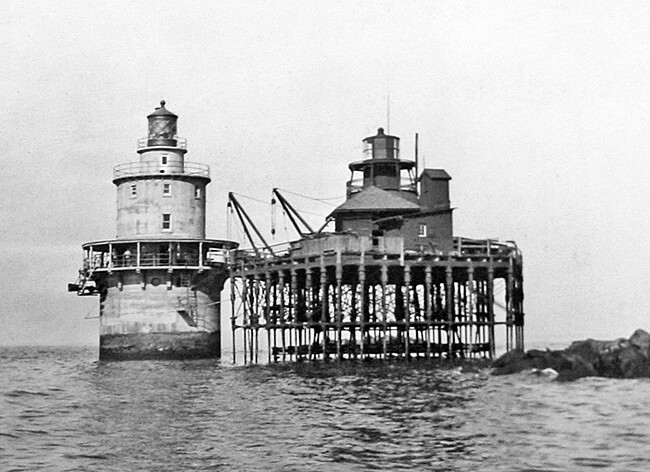 The light from the nation’s first screwpile lighthouse was exhibited on October 28, 1850, and Lightship “N” was soon relocated to replace the destroyed Minot’s Ledge Lighthouse. When first lit in 1850 by Keeper John Burton, Brandywine Lighthouse became just the third U.S. lighthouse to be equipped with a Fresnel lens. In this case, it was a third-order lens manufactured in Paris by Henry-Lepaute. The Fresnel lens had been used in Europe since the 1820s, and mariners who had sailed abroad knew the lenses produced a far superior light. The U.S. was slow in adopting the technology mostly due to the parsimonious Stephen Pleasonton, head of the U.S. Lighthouse Service. An ad hoc Lighthouse Board, charged with improving the country’s lighthouses, conducted an experiment at Brandywine Shoal with the Fresnel lens. The board was transported by vessel to a point fifteen miles east of Brandywine Shoal, 6.25 miles north of Cape Henlopen Lighthouse, and 8.75 miles south of Cape May Lighthouse. Both of these other lighthouses were coastal beacons, equipped with numerous lamps and reflectors. 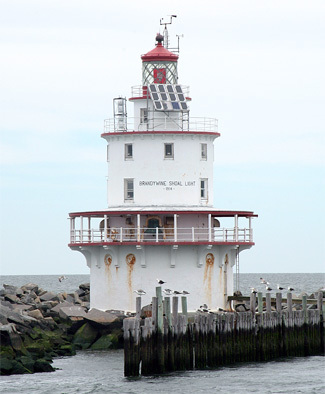 The board observed the three lights and concluded, without difficulty, that Brandywine Light was at least three times more brilliant even at a greater range than either of the first-class seacoast lights, while burning just one-third the amount of oil. 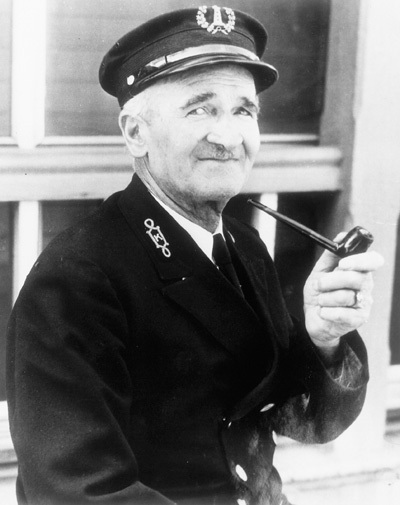 Not long thereafter, the Lighthouse Board assumed control of the Lighthouse Service from Pleasonton and started installing Fresnel lenses in all American lighthouses as quickly as possible. Large fields of ice drifting down with the wind to the northward, shaking the house terribly and continuing until the 15th, with the wind from the E. and N. N. E. Large body of ice came from the eastward with such force that caused the house-posts on that side to spring, so that one would suppose that it would part or remain bent; but they held on remarkably, though at the same time bending the bars attached to the ice-breaker used for fenders, likewise the stepladder. … It certainly is astonishing how the house does to bear the great pressure occasioned by the ice; but the supposition is, with us, if we can be called judges, that if every winter is like this and winter of 1852, it would jar the frame-work off inside, if not entirely sweep away the house. With moderate winters the house will stand for ages. Nothing can do it the least harm except the ice. The keeper’s letter triggered an inspection of the lighthouse, which resulted in over $25,000 being provided in 1856 to protect and preserve the structure. After several years, there was some concern as to the condition of the iron screwpiles supporting the lighthouse, and a diver was sent down in the waters in July 1873 to examine the effect of time and saltwater on the pilings. The wear on the pilings was varied. Some had lost a half-inch to corrosion, while others showed no appreciable loss. Most of the pilings were bent, but none were found to be more than 15° from vertical. Overall, the foundation was found to be in good condition. In 1877, a new fog bell weighing over 3,000 was installed at the station, replacing the original 500-pound fog bell. A 187° red sector was added to the light in 1884, and in 1892, the light’s characteristic was changed from fixed to twenty-seven seconds of light followed by a three-second eclipse through the installation of a brass shade that was raised and lower around the lamp. In 1901, a fog signal house was built at the station and equipped with a coal-oil engine and an air compressor to sound a Daboll trumpet. 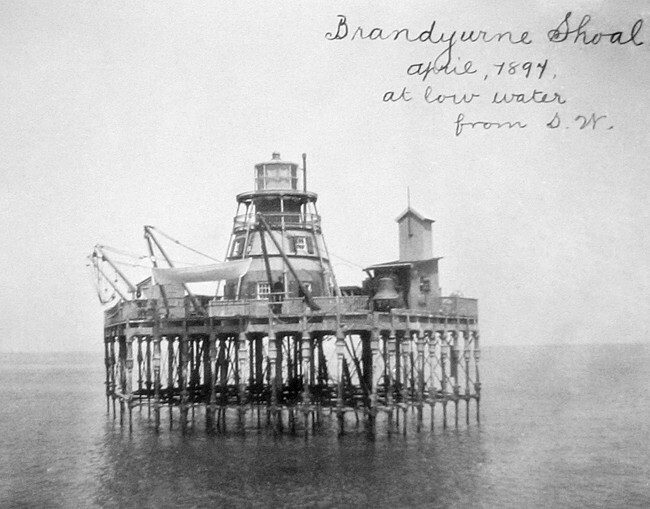 The Brandywine Lighthouse screwpile experiment had proved successful, but by the twentieth century, living conditions at the station were considered somewhat cramped compared to other offshore lights then being built. 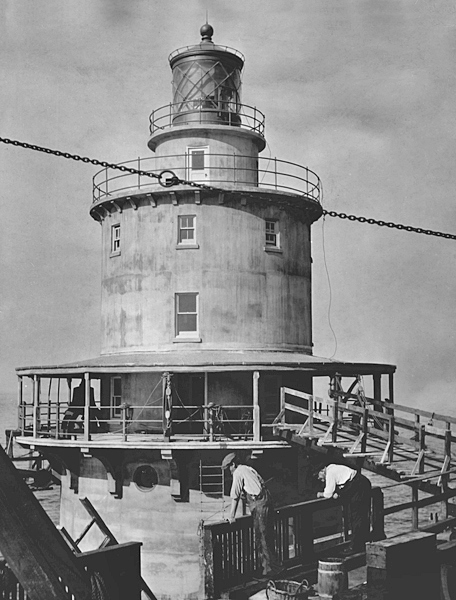 The sum of $75,000 was provided in 1911 for “rebuilding and improving the present light and fog signal at Brandywine Shoal on the present or adjacent site.” The decision was made to build a reinforced concrete lighthouse just fifty feet from the current light, and the Annual Report of the Commissioner of Lighthouses of 1915 provided a detailed description of the newly completed lighthouse. The foundation of the structure consists of a reinforced concrete pier filled with sand, stone and concrete, 35 feet in diameter. At the top of this pier is a reinforced concrete deck 46 feet in diameter and 24 and one half feet above mean low water. 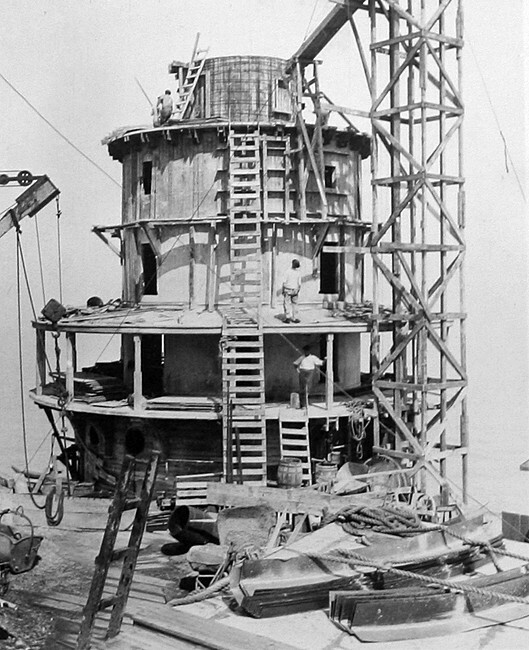 The deck supports a three-story dwelling of reinforced concrete, circular in plan, from the roof of which projects a circular watch room, which supports a third-order cylindrical helical-bar lantern whose focal plane is 60 feet above high water. The main deck is covered by a veranda roof and there are galleries with railings on a level with the watch-room floor and the lantern floor. 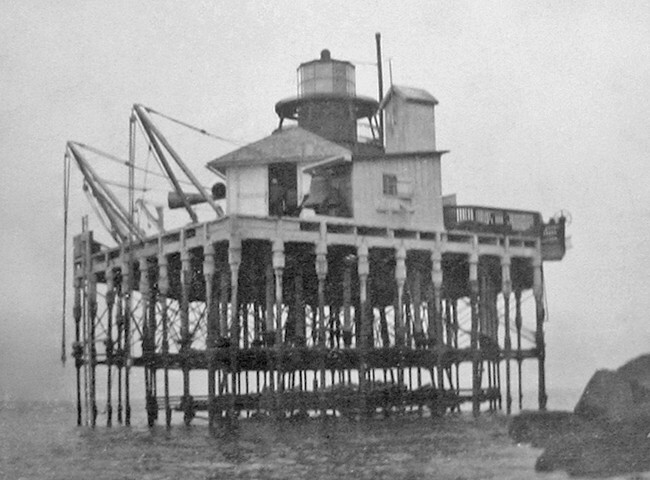 The concrete pier was constructed on shore, launched, towed out to the site, and sunk in place on a pile foundation. The pile foundation consists of 74 timber piles driven about 3 feet on center to a penetration of 19 feet. The heads of the piles project 1 foot above the surface of the shoal, upon which the concrete pier rests. In addition to the wooden pile foundation, the lighthouse is also fixed in position and supported by 12 reinforced concrete piles 16 inches in diameter and 34 feet long. These piles were driven into the shoal through annular pockets near the outer circumference of the caisson and the pockets around the piles filled with concrete. A layer of riprap protects the bottom about the structure. The third-order Fresnel lens was transferred from the old to the new lighthouse where it was first lit on the evening of October 20, 1914. The two towers stood side-by-side for a while until the superstructure of the screwpile light was torn down. 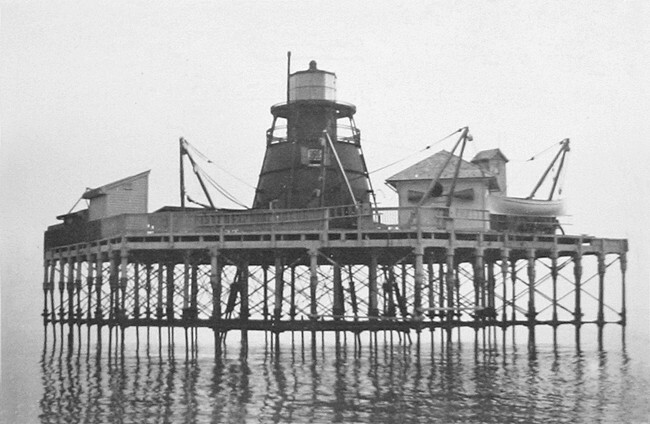 The platform surrounding the old light, however, was retained, and several structures, used by the Navy in the 1940s and 50s, were built thereon. 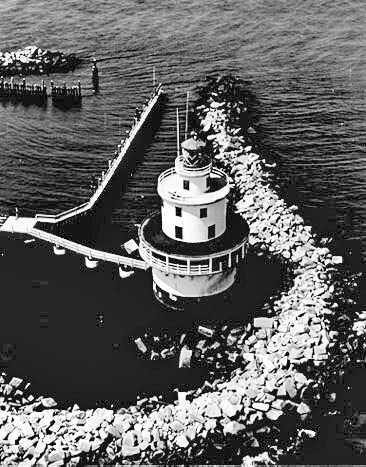 To form a protective harbor near the light, a protective wall of riprap, forming almost a complete circle, was placed around the lighthouse in 1923. Brandywine Shoal Lighthouse was the last remaining manned station on Delaware Bay when it was automated in 1974 – an appropriate distinction for a station where the first screwpile design in this country was deployed, where one of the earliest lightships served, and where tests were conducted with the third Fresnel lens to be used in the United States. 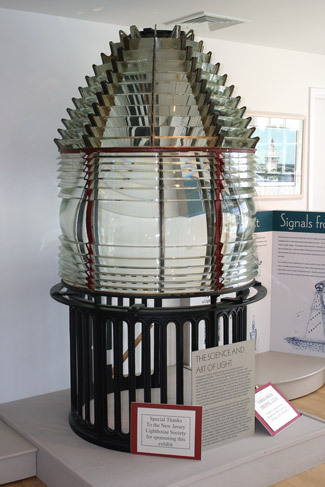 A part of the station’s history can be visited without venturing out into Delaware Bay, as the original third-order Fresnel lens from Brandywine Lighthouse is on display at Tuckerton Seaport in Tuckerton, New Jersey. In June 2011, Brandywine Shoal Lighthouse was declared excess to the needs of the United States Coast Guard and offered to eligible organizations under the provisions of the National Historic Lighthouse Preservation Act of 2000. Qualified entities were given sixty days to submit a letter of interest and were required to obtain a Tidelands Lease from the State of New Jersey to occupy the submerged lands. 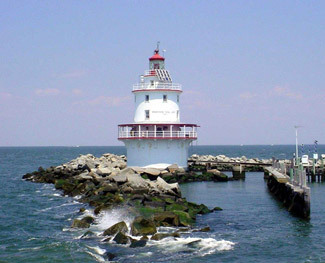 On July 16, 2012, the Lower Township Council, at the behest of the Cape May Maritime Museum and Educational Center, agreed to apply for ownership of the lighthouse, but in February 2013, the National Park Service announced that the lighthouse would be transferred to Brandywine Shoal Lighthouse Inc., a non-profit organization headed by Capt. Jeff Stewart Sr. and Jr., owners of the Cape May Whale Watcher. Stewarts’ company has been running lighthouse boat trips in Delaware Bay since 1993 and hopes to have the lighthouse open to visitors in five years. Head: John Burton (1850 – 1851), William Legg (1851 – 1852), Samuel Willoughby (1852 ), John W. Primrose (1852 – 1854), Samuel Willoughby (1854 – 1861), Abraham Deputy (1861 – 1865), Benjamin Hendrickson (1865 – 1868), Lorenzo D. Morgan (1868 – 1869), Thomas Calhoun (1869 – 1873), Charles McNeill (1873 – 1874), John J. Johnson (1874), William E. Spicer (1874 – 1890), Howard Stiles (1890 – 1893), Eben L. Hudson (1893 – 1896), Thomas T. Moore (1896 – 1906), James D. Wilson (1906), Thomas Wright (1906), Thomas Hasting (1906 – 1915), Lawrence J. Farley (1915 – ), Wellington C. Lloyd (at least 1917 – 1918), Charles R. Manlove (at least 1918), John Colofen (at least 1919), Frank S. Palmer (at least 1921 – at least 1926), George H. Hickman ( – 1939), Edward F. Warrington (1939 – at least 1948). First Assistant: John F. Black (at least 1853 – 1855), James Lee (1855 – at least 1857), James Hughes (at least 1859), Benjamin Hendrickson (1861 - 1862), Frank Elliott (1862 – 1868), John Harrington (1868 – 1869), William Truitt (1869 – 1870), Joseph A. Vincent (1870), William B. Morgan (1870 – 1873), H.B. Conwell (1873 – 1875), Eben L. Hudson (1875 – 1893), Joseph M. Harrison (1893 – 1895), Samuel S. Baker (1895 – 1899), James D. Wilson (1899 – 1906), Thomas W. Magee (1906), William F. Spear (1906 – 1907), Julian Bacon (1907 – 1908), Aaron S. Kinney (1908 – 1909), Alvin F. Wilgus (1909 – 1912), Henry C. Wingate (1912 – 1913), Charles L. Gray (1913), Freddie C. Hill (1913 – ), John Anderson ( – 1915), James W. West (1915 – ), John Colofen (at least 1918 – at least 1918), George A. Jones (at least 1919), Clyde S. Harrison (1921 – 1924), Edward F. Warrington (1924 – 1939), Harry T. Wilson (1939 – 1944), Charles Plummer (1944 – 1953). Second Assistant: Charles Wilson (at least 1853 – 1855), Justin Wilson (1855 – 1857), Peter Johnson (1857), Francis Elliott (1859 – 1861), T.P. Harper (1861), A.P. Scott (1861 – 1862), Jesse Deputy (1862), Burton Deputy (1862 – 1863), John Harrington (1863), Jesse Deputy (1863 - 1864), B.B. Deputy (1864), Mason Webb (1864 – 1865), James M. Watts (1865 – 1867), Trasten P. Harper (1867 – 1868), Sylvester D. Clements (1868 – 1869), Jacob Stokeley (1869 – 1871), Henry H. Morgan (1871 – 1873), Thomas H. Calhoun (1873), Eben L. Hudson (1873 – 1875), Lemuel R. Walls (1875 – 1886), William H. Bennum (1886), James A. Stevens (1886 – 1888), Joseph M. Harrison (1888 – 1893), Samuel S. Baker (1893 – 1895), James D. Wilson (1895 – 1899), Daniel Bailey (1899), Earvin Carter (1899 – 1905), George H. Buchanan (1905 –1906), Harry F. Hann (1906), Oather F. Kirby (1906), William F. Spear (1906), Julian Bacon (1906 – 1907), Aaron S. Kimmey (1907 – 1908), Alvin F. Wilgus (1908 – 1909), Thomas W. Magee (1909), Charles L. Gray (1910 – 1913), Henry P. Marshall (1913 – ), Clarence M. Jefferson (1914 – 1915), John Garrison (1915), John E. Collins (1915), Harold Hutchins (1915 – 1916), Walter C. Taylor (1916), Wellington C. Lloyd (1916 – at least 1917), Harry Fuller (at least 1919), Elmer O. Mitchell (1920), Orrie B. Magee (1937 – 1944). Third Assistant: Alson Mills (1857), Richard Chadwick (1857 – 1861), Henry H. Morgan (1871), Alfred B. Carpenter (1871 – 1873), Jackson B. Murray (1873 – 1874), Lemuel R. Walls (1874 – 1875), William D. Fisher (1875), Martin D. Short (1875 – 1881), Thomas H. Chipman (1881), David D. Murray (1881 – 1882). 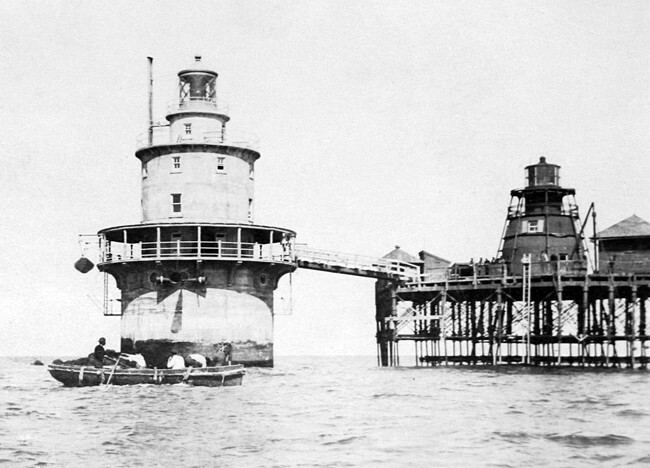 “A Lighthouse For Brandywine Shoal,” Wayne Wheeler, The Keeper’s Log, Summer 1999. Guiding Lights of the Delaware River and Bay, Jim Gowdy and Kim Ruth, 1999. “Cape May Whale Watcher Group Likely to Own Lighthouse,” Jack Fichter, Cape May County Herald, February 20, 2013. Located in the Delaware Bay about 8.5 miles northwest of Cape May. 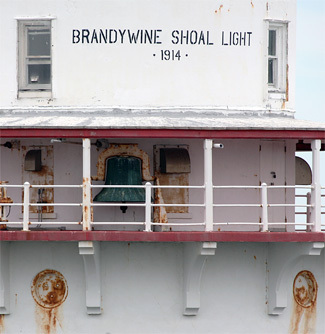 For a larger map of Brandywine Shoal Lighthouse, click the lighthouse in the above map. The lighthouse is best seen from the water. 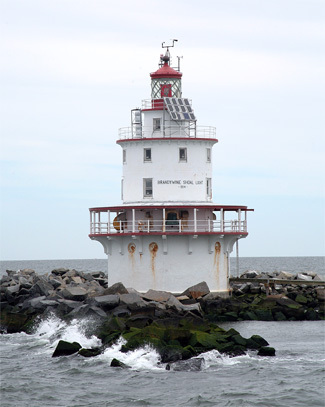 Cape May Whale Watcher and Delaware Bay Lighthouse Keepers & Friends both offer cruises during the summer that pass by the Brandywine Shoal Lighthouse. The lighthouse is owned by Brandywine Shoal Lighthouse Inc.. Tower closed.